Before I go to bed a quick update on my earlier entry about the news of the collapsed silo at Port Ellen Maltings on Islay. I've just received two pictures which give an impression of the collapsed silo. From what I understand the silo collapsed at about 05:20 am this morning, which must have been a quite scary wake up call. 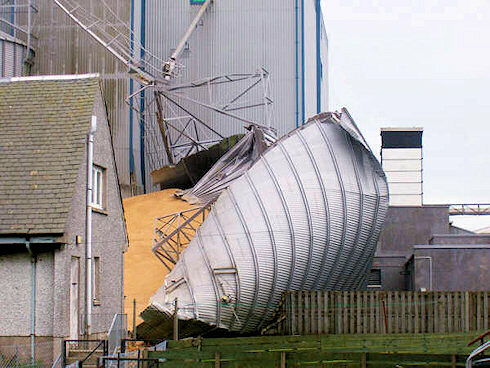 6 houses at Bay View were evacuated and the A846 has been closed as a precaution in case the other silo also goes. Traffic is currently diverted via the Emerivale road (which is mostly single track), so delays are probably inevitable. 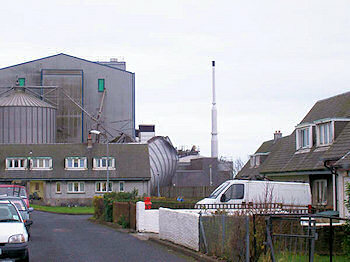 Engineers have arrived on Islay this evening to assess the remaining silo (Was it impacted by the other one falling? Could it potentially develop the same problem?) and what to do with the collapsed one. Related some information from Elliott on the MV Shetland Trader which arrived on Islay yesterday with a load of malting barley: Due to rain it didn't discharge its load yesterday, when they were going to start today they had to be informed there wasn't any storage for it. As I've said before, the most important thing as far as I'm concerned is that nobody got hurt (apart from possibly the professional pride of an engineer/ architect somewhere). If there is any impact to whisky production is secondary, although Diageo is already stating that they don't expect any effect on whisky production.